Lacuna Loft > Advocacy + General About > Advocacy > Have You Heard Of GiveForward? Today we are sharing about a fantastic company out there called GiveForward! 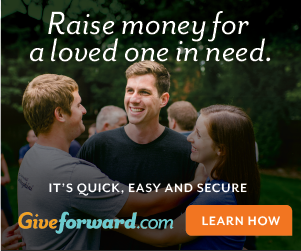 www.giveforward.com is an online fundraising platform, that helps people raise money to pay for medical (or vet!) bills! Each fundraising campaign is assigned a Personal Coach from the GiveForward team. This person helps you start a fundraiser and offers advice and support along the way as well. GiveForward works really hard to make the fundraising process super easy! To date, 65,000 people have created a fundraiser through GiveForward and over $90 million has been raised! One thing I experienced while going through my mother’s treatments and then my own…people ask, How can I help? Well that answer can now be easily answered for everyone out there feeling the financial strain of going through a medical crisis. Fine Print – Links throughout this post are referral links. If you initiate a fundraiser, Lacuna Loft receives a small commission. Please understand however, the words and opinions stated above are those of the author.